Type: Moving character graphics/Text input/Music Written 1989 by Roberta Williams. Notes: The package includes a 15-page playbook, a Misty Acres Plantation featuring 23 fingerprints of the suspects (the copy protection), cardboard magnifying glass with red filter (to decipher the encoded fingerprints), monographed notebook from Tulane University, pencil from Tulane University. The PC version comes on ten 5 1/4" disks and four 3 1/2" disks. 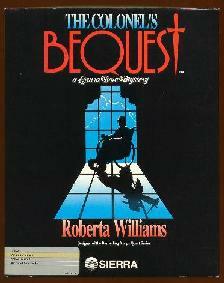 Comments: The Colonel's Bequest, an old send-back to "Ten Little Indians" and the Agatha Christie novels of the 1920's, was the first Sierra game to be laid out in play format through eight acts or chapters (a tactic they now employ often). Laura's friend Lillian invites her to her secretive uncle's estate, but little does she know one by one someone will start killing off the Dijon clan to get at his fortune. Game includes a fair share of both deductive puzzles, and typical adventure ones. Features two different endings, a right one and a wrong one, based on your final action. The game closes with a detective rating, dependant on how much of the mystery you actually solved. It is the year 1925, and the roaring '20's are well underway. As Laura Bow, young college student, you've been invited to visit the Colonel's isolated estate. Watch as the Colonel announces his intention to bequeath his millions to all present! Immediately, you sense greed and suspicion among the Colonel's relatives and associates. The air becomes thick with anger betrayal. As the drama unfolds you must evade the dangers that await you everywhere, and expose the killer before he or she strikes again! Type: Moving character graphics/Point-n-Click/Music Written 1991 by Roberta Williams and Bruce Balfour. Notes: The package includes a 60-page Leyendecker Museum manual featuring the bios of 12 Egyptian Gods and Goddesses (the copy protection), a Leyendecker Egyptian Exhibit brochure, a 30-page Sierra Game Manual and an additional instructions card. It was released both on disk and later, on CD. The PC version comes on six 5 1/4" disks and one CD-rom. The CD version adds speech (unless that's in the diskette version as well?). Comments: Laura Bow moves to the Big Apple for her promising new career as a reporter and is quickly assigned the scoop of learning about the newly excavated artifact, the Dagger of Amon Ra, at the Leyendecker Museum. Of course, you know she can't go anywhere without people getting bumped off around her, so luckily by the end of the game, she'll have a much bigger scoop to worry about. Game is played in six acts, although the mystery itself doesn't start until the conclusion of the second act and is basically over after the fourth act (the fifth is a chase scene from the murderer and the sixth is your providing the coroner with the criminals and their motives) so it's disjointed, to say the least. A pointless romance for our heroine is thrown in and it does succeed in stopping the action cold. A high point is the many different endings, most of which are comical. Based on how well you solve all the mysteries, Laura could get promoted, demoted, murdered, or drive her father to an insane asylum and other suspects to suicide. Laura Bow, intrepid heoine of The Colonel's Bequest, is back! This time she's trapped in a huge, imposing museum in the dead of night, surrounded by socialites, miscreants, thieves... and a cold, relentless murderer. Are you ready to meet the challenge? 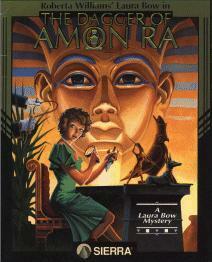 Can you discover the truth about the pricless Dagger of Amon Ra before the killer discovers... you?